Rated 5 out of 5 by ladykristi from Really fun I can't stop playing this game. Not many games entertain me to the point where I'm excited to start playing where I left off. It has definitely helped me escape my reality. Which is a good thing and the sole purpose why I play games. Definitely worth playing! Rated 5 out of 5 by sparklefish777 from Fun Spa Game! This is a colorful game with sharp clear graphics and easy to follow instructions. Clients go through an assembly line of services. Trim eyebrows, put on face masks, give massages, paint nails and more. There are a few salons in different places all over the world. Nice game! Rated 5 out of 5 by lorishere1 from LOVE This Game! Im a huge fan of the "Sally's" games and this one is my favorite. I love all the upgrades and in this game you get to sell retail. I have played all 3 and the Collectors Edition. I hope they come out with another Sally's game. Rated 5 out of 5 by merlinarcane from Great Little TM Game! I was tempted not to even bother with the game, since it seems to be such a small file game; however, as with others of this series, this is really a great game! With 50 levels involving 10 spa locations, the goals of each location are achievable in three modes: reached, expert, perfect. 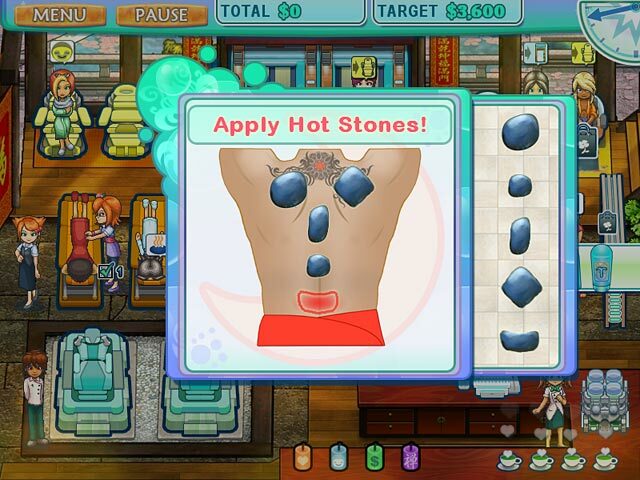 The miniskills games that are part of each service that you provide in the spas are cute and different. 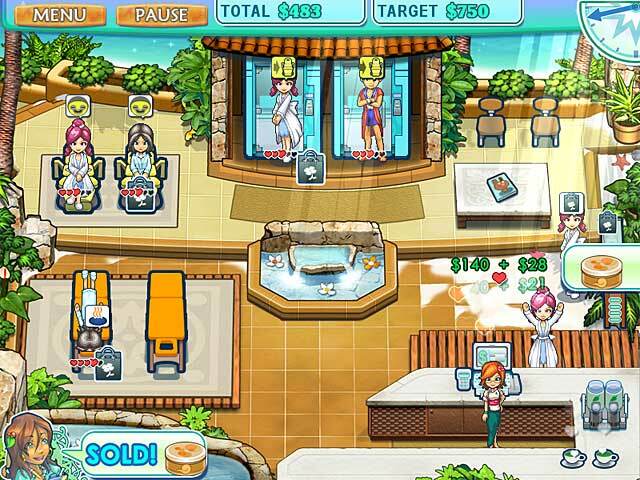 The concept of the game is to develop the spa locations by buying upgrades or hiring personnel to help you along. 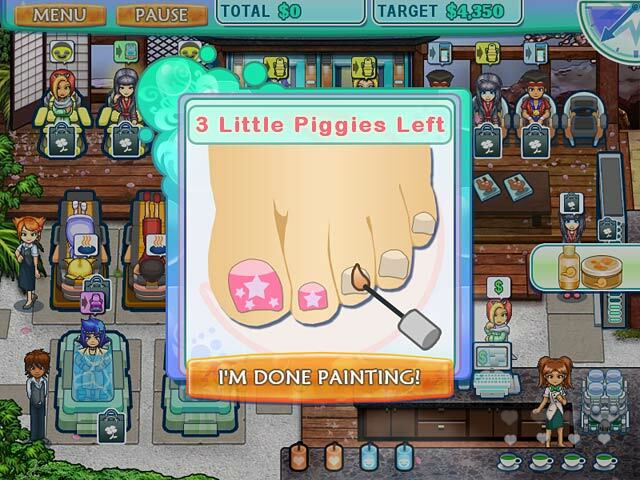 One of the unexpected goodies of the game is a "side" challenge of developing not only the spas but yourself as a retail magnate of salon products. Gaining expertise and promotions based on how well you can figure out which products to sell is a bonus for the fun of the game. The game has great graphics and a sense of humor about its characters and their actions and reactions. I highly recommend this game and the other two in the series; they're all high quality fun and can be won and/or completed without being a mouse-clicking maniac dragging characters all over the screen! Rated 5 out of 5 by 3meme from Great time management game Lots of fun. Own this and it will be one that I'll play for a long time. 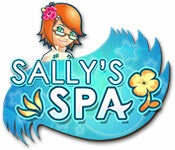 Rated 5 out of 5 by zuzaneczka from Sally's spa Amazing love this game great quality. Rated 4 out of 5 by Turpasauna from A bit too easy but lots of fun This is my favourite out of the Sally series. Located in a small spa, it manages to relax YOU as well via nice, soothing music and patient customers (okay, almost all of them..). The graphics are good and pleasing to the eye, music and sound effects work nicely too. Very easy to get lost in this game; "I'll just play one more stage...location...wait, what time is it??" Only complaint is that like the other Sally games, this too suffers from lack of challenge. On the other hand it makes the game great for beginners. Rated 4 out of 5 by shenasotto051680 from it's nice to play it's fun to play and many games that easy to learn and play. Rated 4 out of 5 by tricky_trinkets from Fun Game If you're a big fan of time management games you'll definetly love this. As part of the Sally's time management game series it's really quite a fun. I love the challenge as new SPA treatments comes on each levels. Have fun on the spa! Rated 4 out of 5 by LavaReign from simple fun Simple and fun game, not at all difficult, I never "lost" a client or failed to complete a level. This was certainly not up to par with Roads of Rome but it was fun to play and the music and spa atmosphere were very relaxing. Rated 2 out of 5 by desertdusk from 5 star reviews not for everyone I always play the trial and then read reviews before purchasing a BFG game. The trial seemed entertaining and the reviews were through the roof with 5 stars! But be warned... This game is for good strategists and very fast clickers. If you like to achieve expert and perfect scores, no matter how determined you are, you're not going to get satisfaction unless you are a whiz bang fast player. I've been playing this game every night for three weeks and still get hung up on 2 or 3 advanced levels. No matter how I change strategies, try to go faster, or start over with a new player, I simply can't get perfect scores on all levels. The BFG forums are usually very helpful but in this case, they just tell you to be patient and play levels repeatedly until you beat them. Well, I've done that, and more, and I'm finally giving up. I know I can't be the only one out here who has been disappointed. Hope you have better luck!